Why is it so hard to stick to a routine? Each day we roughly have an idea of getting out of bed, changing our clothing, eating and heading out the front door. Why is it be so hard? In a effort to ‘help’ my children with their morning routine I have created a Morning Routine Chart. For my lovely blog reading friends I am going to share it using Google Documents here (low resolution) and here (high resolution). There are many fridges graced with all sorts of charts and mine is no different. Somehow I have held to a misconception that my kids don’t need a reminder chart. At each ASD related appointment I was reminded of how important visual aids can be but I still held onto the belief that my children didn’t need them. For now I have given into the visual chart system and will have the above stuck somewhere in my house. I am not sure where its home will be, as I have yet to consult my favourite children. The big question is where will they find this most useful? In the kitchen, on a wall, on the side of their bedroom cupboard the possibilities are endless. 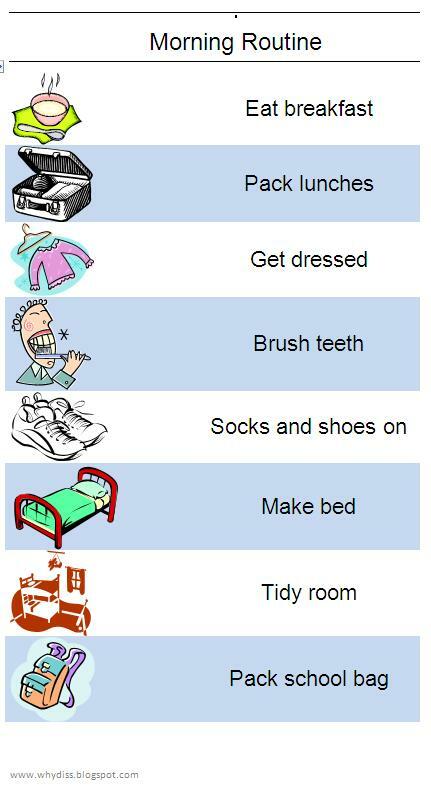 Is routine a dirty word in your house? Am I the only mother struggling to get her children out the door each and every morning.